Abstract: Older cancer survivors may be predisposed to falls because cancer-related sequelae affect virtually all body systems. The use of a history of falls, gait speed, and balance tests to assess fall risks remains to be investigated in this population. This study examined the relationship of previous falls, gait, and balance with falls in community-dwelling older cancer survivors. At the baseline, demographics, health information, and the history of falls in the past year were obtained through interviewing. Participants performed tests including gait speed, Balance Evaluation Systems Test, and short-version of Activities-specific Balance Confidence scale. Falls were tracked by mailing of monthly reports for 6 months. A “faller” was a person with ≥1 fall during follow-up. Univariate analyses, including independent sample t-tests and Fisher’s exact tests, compared baseline demographics, gait speed, and balance between fallers and non-fallers. For univariate analyses, Bonferroni correction was applied for multiple comparisons. Baseline variables with P<0.15 were included in a forward logistic regression model to identify factors predictive of falls with age as covariate. Sensitivity and specificity of each predictor of falls in the model were calculated. Significance level for the regression analysis was P<0.05. During follow-up, 59% of participants had one or more falls. Baseline demographics, health information, history of falls, gaits speed, and balance tests did not differ significantly between fallers and non-fallers. Forward logistic regression revealed that a history of falls was a significant predictor of falls in the final model (odds ratio =6.81; 95% confidence interval =1.594–29.074) (P<0.05). Sensitivity and specificity for correctly identifying a faller using the positive history of falls were 74% and 69%, respectively. Current findings suggested that for community-dwelling older cancer survivors with mixed diagnoses, asking about the history of falls may help detect individuals at risk of falling. Cancer is a chronic condition of older adults. Approximately 77% of cancers are diagnosed in adults 55 years and older.1 The 5-year survival rate is 69.8% for adults 55–64 years, and 58.6% for adults ≥65 years.1 By 2024, the number of cancer survivors will likely reach 19 million with the aging population and improved survival.2 The need for rehabilitation services to improve function in aging cancer survivors present a significant challenge. Falls and fall-related injuries are serious problems in older adults.3 Older cancer survivors may be predisposed to falls because cancer- and treatment-related side effects impact virtually all body systems.2 Pain, fatigue, muscle weakness, vision and cognitive impairments, difficulty with balance and walking can emerge while a person is receiving cancer treatments or develop years after treatments have completed.2,4–6 Decline in physical function after the cancer diagnosis is often undetected or untreated.4 In a sample of Medicare and Medicaid recipients aged 65 years and older, a fall occurred at a significantly higher rate (33%) in cancer survivors than those without cancer (29%).7 The odds ratios for having one fall in the past 12 months had been estimated to be 1.16–1.17 (95% confidence interval [CI] =1.02–1.33)7,8 between older cancer survivors and older adults without a history of cancer. A population-based study reported that the risk of two or more falls within 1 year was 27% higher in postmenopausal women with cancer compared to women without cancer.9 Taken together, fall risks may be increased in older cancer survivors. The aim of this prospective pilot study was to investigate the relationship of previous falls, gait, and balance with falls in older cancer survivors living in the community. The objective was to determine whether a history of falls, gait speed, and balance performance assessed using a standardized and multi-domain clinical test at baseline would be associated with falls during a 6-month follow-up period in older cancer survivors. It was hypothesized that a positive history of falls, slower gait speed, and impaired balance would be predictive of future falls in older cancer survivors. A person is considered as a cancer survivor from the time of diagnosis until death.16 Cancer survivors living in the community were recruited via advertisements, flyers, and presentations at local oncology clinics, support groups, and health fairs. The inclusion criteria included age ≥55 years, first cancer diagnosed ≥1 year prior to enrollment in the study (not involving the nervous, integumentary, or musculoskeletal systems), completion of primary cancer treatments ≥3 months (chemotherapy, surgery or radiation), and ability to walk ≥50 ft without another person’s assistance. The exclusion criteria included cancer metastases, acute illness, impaired cognition assessed by the Mini-Cog, 10% low-contrast binocular and corrected vision less than 20/60 on Snellen chart, unstable cardiopulmonary conditions, severe pain affecting standing and walking, and a history of neurologic conditions. The University of Michigan–Flint Institutional Review Board approved the study. All participants gave their consent. An investigator reviewed the medical documents provided by participants and conducted an interview to collect demographics, health information, and history of falls. The impact of comorbidity on physical function was assessed using Functional Comorbidity Index, a self-report measure of 18 medical conditions. A score of 0 is no comorbidity and 18 indicates the highest number of comorbidities.17 The plantar tactile sensation on three sites of each foot was assessed using a 5.07/10 g Semmes-Weinstein monofilament.18 Other investigators administered tests of gait speed and balance to minimize bias. After testing, falls were tracked for 6 months via mailing of monthly fall reports. All investigators followed the same protocols. An investigator explained the definition of falls and asked the participants “How many times have you fallen in the past 12 months?” Participants reporting one or more falls were identified as having a history of falls. To assess prospective falls, participants recorded falls daily on a calendar by writing “F” if they had a fall and “N” if they did not fall. The definition of falls was printed on the calendar. Each calendar was mailed to the investigators after completion. A fall report that was not received by the 3rd week of the following month was confirmed verbally by phone. Data from participants who did not return the calendar or phone call were excluded from further analysis. Participants with one or more falls during follow-up were identified as fallers. Participants walked at usual pace over an 8-meter path. The intermediate 4-meter was timed. An investigator started and stopped timing using a stopwatch when the participant’s leading leg crossed a line at 2 meters and 6 meters of the path. Using a stopwatch to obtain 4-meter gait speed was found to demonstrate excellent test-retest reliability (intraclass correlation coefficient [ICC] =0.96) and concurrent validity with gait speed measured using a wireless automatic timer (ICC =0.99).19 The average of two trials was obtained. BESTest is a comprehensive, reliable, and valid test with 36 balance and walking tasks.15 It was designed to locate specific impairments within multiple domains of balance control, including: 1) biomechanical constraints, 2) stability limits, 3) anticipatory postural adjustments, 4) reactive postural responses, 5) sensory orientation, and 6) gait stability. The total score of BESTest and the sub-scores of each domain are expressed as percent scores (%), which are the percentage of maximum points possible within the BESTest and each domain, respectively. Higher scores indicate better balance. The BESTest total score and sub-section scores were obtained. ABC-6 is a self-report measure to assess balance confidence and fear of falling during six daily activities.20 It is a patient-centered outcome measure reflective of balance skills required in one’s environment.20 Participants rated their level of balance confidence and fear of falling in doing each activity from 0% (no confidence, highest fear of falling) to 100% (complete confidence, no fear of falling). The average of all item scores was obtained. SPSS version 21 (IBM Corporation, Armonk, NY, USA) was used for statistical analysis. In univariate analyses, baseline differences in demographics, health information, a history of falls, gait speed, BESTest total score and sub-scores, and ABC-6 were compared between fallers and non-fallers using independent sample t-test for continuous variables and chi-square test for dichotomous variables. Bonferroni correction was used for multiple comparisons between fallers and non-fallers, with P<0.0056 being statistically significant for the demographics and health information and P<0.005 for a history of falls, gait speed, BESTest, BESTest sub-sections, and ABC-6. Subsequently, baseline variables that differed between fallers and non-fallers at P<0.15 were included as independent variables in a forward logistic regression model to identify factors independently associated with falls. Age was entered as the covariate in the model. Coding for falls as the dependent variable in the model was 1 for fallers and 0 for non-fallers. The P-value cut-off point of 0.15 has been recommended for selection of variables in logistic regression analyses because a traditional P-value such as 0.05 can fail to identify important variables.21 The significance level was P<0.05 for the regression analysis. Sensitivity and specificity of significant predictors of falls in the regression model were calculated. Of 44 participants enrolled at baseline, five did not return fall calendars or return phone calls about falls during follow-up. Data from the remaining 39 participants were analyzed. At baseline, participants were on average 67.9 years old (standard deviation =8.8 years; range =55–88 years). The majority were women (72%) and had breast cancer (54%). 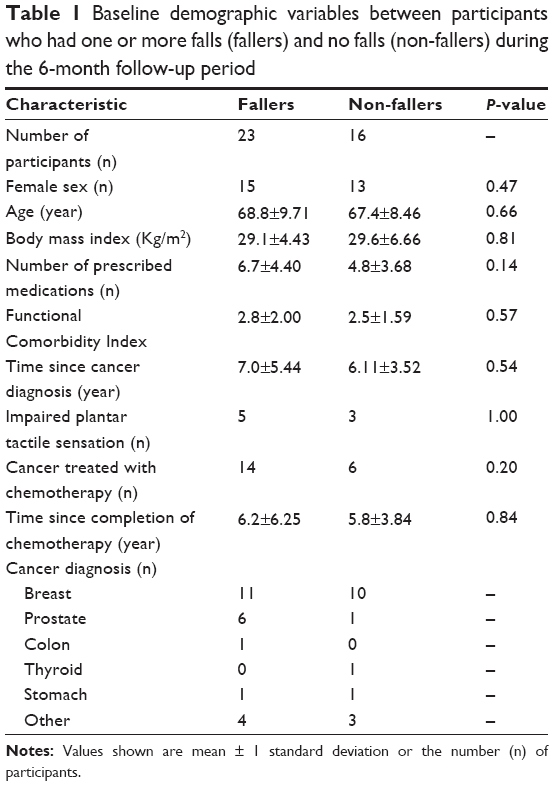 As shown in Table 1, baseline demographics and health information, including age, body mass index, number of medications, Functional Comorbidity Index, time since cancer diagnosis, percentage of participants with chemotherapy, and time since completion of chemotherapy were not significantly different between fallers and non-fallers. Approximately 21% of participants had impaired plantar sensation but the proportion of participants with sensory impairments was similar between fallers and non-fallers (Table 1). Notes: Values shown are mean ± 1 standard deviation or the number (n) of participants. In the preceding 12 months prior to enrolling in the study, 56% of participants had at least one fall. At the end of 6-month follow-up, 23 participants had fallen at least once, of whom ten participants (10/23=44%) had two or more falls. Seventeen (74%) of the fallers had a history of falls in the preceding 12 months prior to study entry. Only five of the non-fallers (31%) had a history of falls. The proportion of participants with a history of falls was not significantly different between fallers and non-fallers (P=0.008). At baseline, fallers (1.00±0.241 m/s) and non-fallers (1.02±0.168 m/s) did not differ significantly in gait speeds. BESTest total scores did not differ between fallers (83.3%±7.65%) and non-fallers (82.6%±9.35%) (Figure 1). The sub-score of the sensory orientation domain of BESTest was not significantly different between fallers (86.9%±12.47%) and non-fallers (93.8%±5.69%) (P=0.02). No significant differences between groups were found in other BESTest domains (Figure 1). Fallers (73.7%±15.90%) and non-fallers (74.1%±20.66%) did not differ significantly in scores of ABC-6. Figure 1 Mean (± 1 standard deviation) of the Balance Evaluation Systems Test (BESTest) total score and the sub-scores of the six domains of BESTest in fallers and non-fallers. Notes: BESTest domains: I, biomechanical constraints; II, stability limits; III, anticipatory postural adjustments; IV, reactive postural response; V, sensory orientation; VI, stability in gait. Scores are as percentages (0%–100%) of the maximum points possible within the entire BESTest for the BESTest total score and within each domain for the BESTest sub-scores. Based on the results of univariate analysis, the number of medications, history of falls, and sub-score of the sensory orientation section of BESTest were included as independent variables in the forward logistic regression model. The final model was significant with the history of falls as a predictor of falls (pseudo R2 by Cox and Snell =0.181; χ2=7.78, P<0.05) (Table 2). The odds ratio for the history of falls as a predictor of future falls was 6.81 (95% CI =1.594–29.074) (P=0.01). For an older cancer survivor with at least one fall in the preceding 12 months, the odds of having one or more falls in the next 6 months were 1.91. In this sample, sensitivity and specificity for correctly identifying a faller using a positive history of falls were 74% and 69%, respectively. Abbreviations: CI, confidence interval; SE, standard error. This pilot study examined the association of a history of falls, gait speed, and clinical balance tests with falls in community-dwelling older cancer survivors. Our hypothesis was that a positive history of falls, slower gait speed, and impaired balance would predict future falls in older cancer survivors. Univariate analyses showed that a history of falls, gait speed, and balance performance at baseline did not differ significantly between fallers and non-fallers. Logistic regression analysis revealed that a history of one or more falls in the preceding 12 months significantly predicted falls over 6 months. Taken together, these findings partially supported the hypothesis. While this study focused on commonly used physical therapy assessment for fall risks, including past falls, gait speed, and balance, it should be noted that falls are multifactorial in older adults.26 A recent systematic review has indicated that risk factors of falls are unique in older cancer survivors.27 Factors indicative of falls in the general population, including age, polypharmacy, and opioid use, were not predictive of falls in older cancer survivors.27 Cancer- and treatment-related factors, including pain, chemotherapy, and cancer stage are significantly associated with falls.27 In this pilot study of community-dwelling older cancer survivors with mixed diagnoses, an interesting finding is that a history of falls was predictive of falls. This finding is consistent with those from a study of 88 men receiving androgen deprivation therapy for prostate cancer at an outpatient setting.10 A prior history of falls in the past 12 months, being unmarried, and arthritis were independent predictors of falls.10 On the contrary, age, education, comorbidity, 6-minute walk, activities of daily living, and androgen deprivation therapy were not associated with falls.10 While multiple factors can contribute to falls in an individual,26 current results indicate that screening fall risks using a simple question about falls is an important step in fall prevention. It can be easily implemented in clinical oncology practice. A population-based study has shown that in older adults, falls were an independent predictor for the onset of fear of falling whereas fear of falling was predictive of future falls. These findings provided the evidence of a spiraling effect of increasing falls and fear of falling.28 In this study, baseline scores of ABC-6 did not differ between fallers and non-fallers, suggesting that the level of balance confidence and fear of falling was not associated with future falls in current participants. Cancer survivors aged 40–64 years undergoing or having completed chemotherapy within 20 months were found to have higher fear of falling compared to non-cancer controls.29 Older adults who have fallen are likely to develop fear of falling and vice versa, escalating the risk of falls, fear of falling, and functional limitations.28 The interplay of falls, fear of falling, and function among older cancer survivors remains to be investigated. Gait speed, recognized as the sixth vital sign, is a reliable and valid measure.30 Gait speed reflects health and functional status of multiple body systems, including the cardiopulmonary, nervous, and musculoskeletal systems.31 Slow gait speed is predictive of future health status,30 functional decline,30 falls,30 and mortality.31 In this study, usual gait speed was not associated with future falls. Gait speeds for fallers (1.00±0.241 m/s) and non-fallers (1.02±0.168 m/s) were below normal gait speed (1.2–1.4 m/s).30 The relationship between gait speed and falls is likely U-shape. Quach et al32 reported that older adults with faster (>1.3 m/s) and slower (<0.6 m/s) gait speed were at higher risk of falling. Future studies are necessary to examine the relationships between faster and slower gait speeds with falls and other health outcomes in older cancer survivors. This study chose a comprehensive balance test, BESTest,15 to identify specific impairments in various domains of balance control in older cancer survivors. Current findings did not support the use of BESTest and BESTest sub-sections to detect fall risks in community-dwelling older cancer survivors of mixed diagnoses. The criterion values of BESTest for detecting fallers among older adults have not been established. In persons with Parkinson’s disease, the cut-off scores of BESTest to detect fallers was 69%,33 which was lower than the average BESTest scores in this study (82.6% for non-fallers and 83.3 for fallers). Difficulty in integrating vestibular inputs in fallers has been reported in a study of breast cancer survivors.5 Compared to non-fallers, fallers showed increased postural sway measured by a force plate when standing on a moving surface with eyes closed or looking at a moving visual surround.5 Commonly used chemotherapy agents for treating cancers, such as taxane, vinca alkaloid, and taxane, are known to cause neuropathy and vestibular dysfunction.2,34 In this study, fallers and non-fallers did not differ in the sensory orientation sub-section of BESTest. We did not find any association of impaired plantar sensation or chemotherapy with falls. Different chemotherapy regimens and cancer diagnoses were not analyzed separately in current participants. Future research needs to investigate the influence of chemotherapy and other treatments as well as cancer diagnoses on balance, particularly sensory integration for balance control. This study has limitations. Current participants had a wide age range. The rates of falls increase steadily with age and older adults aged >75 years are twice as likely to fall compared to those aged 65–75 years.22 The causes of falls in cancer survivors may be complex because of the diverse sequelae, cancer diagnoses, and treatments. Studies of larger sample sizes are necessary to elucidate cancer- and non-cancer related factors associated with falls in older cancer survivors in comparison with the general population. Analyses focusing on fall risks related to a specific cancer diagnosis and treatments, such as neurotoxic chemotherapy, are imperative. This study followed-up participants’ falls over 6 months although 2–4 participants were recruited monthly throughout the study period. Prospective tracking of falls for 12 months may unravel the long-term impact of cancer in survivors and counter the potential confounding factors during follow-up, such as reduced activities or slipping on the ice during winter. Current findings have important clinical implications in oncology rehabilitation, particularly for physical therapists at outpatient settings and treating older cancer survivors living in the community. Asking about the history of falls may detect older cancer survivors at risk of falling. This project was funded by the Office of Research and Sponsored Programs and Physical Therapy Department at the University of Michigan–Flint. The authors would like to thank Dr Alex Borja, Dr Tracy Sweeney, and Mr Timothy Houston for their assistance with participant recruitment and data collection. Howlader N, Noone A, Krapcho M, et al. SEER Cancer Statistics Review, 1975–2011. 2014 ed. Bethesda, MD: National Cancer Institute; 2014. DeSantis CE, Lin CC, Mariotto AB, et al. Cancer treatment and survivorship statistics, 2014. CA Cancer J Clin. 2014;64(4):252–271. Tinetti ME, Speechley M, Ginter SF. Risk Factors for Falls among Elderly Persons Living in the Community. N Engl J Med. 1988;319(26):1701–1707. Cheville AL, Beck LA, Petersen TL, Marks RS, Gamble GL. The detection and treatment of cancer-related functional problems in an outpatient setting. Support Care Cancer. 2009;17(1):61–67. Winters-Stone KM, Torgrimson B, Horak F, et al. Identifying Factors Associated With Falls in Postmenopausal Breast Cancer Survivors: A Multi-Disciplinary Approach. Arch Phys Med Rehabil. 2011;92(4):646–652. Bylow K, Dale W, Mustian K, et al. Falls and physical performance deficits in older patients with prostate cancer undergoing androgen deprivation therapy. Urology. 2008;72(2):422–427. Spoelstra SL, Given BA, Schutte DL, Sikorskii A, You M, Given CW. Do older adults with cancer fall more often? A comparative analysis of falls in those with and without cancer. Oncol Nurs Forum. 2013;40(2):E69–E78. Mohile SG, Fan L, Reeve E, et al. Association of cancer with geriatric syndromes in older medicare beneficiaries. J Clin Oncol. 2011;29(11):1458–1464. Chen Z, Maricic M, Aragaki AK, et al. Fracture risk increases after diagnosis of breast or other cancers in postmenopausal women: results from the Women’s Health Initiative. Osteoporos Int. 2009;20(4):527–536. Hussain S, Breunis H, Timilshina N, Alibhai SMH. Falls in men on androgen deprivation therapy for prostate cancer. J Geriatr Oncol. 2010;1(1):32–39. Gewandter JS, Fan L, Magnuson A, et al. Falls and functional impairments in cancer survivors with chemotherapy-induced peripheral neuropathy (CIPN): a University of Rochester CCOP study. Support Care Cancer. 2013;21(7):2059–2066. Chen TY, Janke M. Predictors of falls among community-dwelling older adults with cancer: results from the health and retirement study. Support Care Cancer. 2014;22(2):479–485. Ward PR, Wong MD, Moore R, Naeim A. Fall-related injuries in elderly cancer patients treated with neurotoxic chemotherapy: A retrospective cohort study. J Geriatr Oncol. 2014;5(1):57–64. Puts MT, Monette J, Girre V, et al. The fall rate of older community-dwelling cancer patients. Support Care Cancer. 2013;21(3):775–783. Horak FB, Wrisley DM, Frank J. 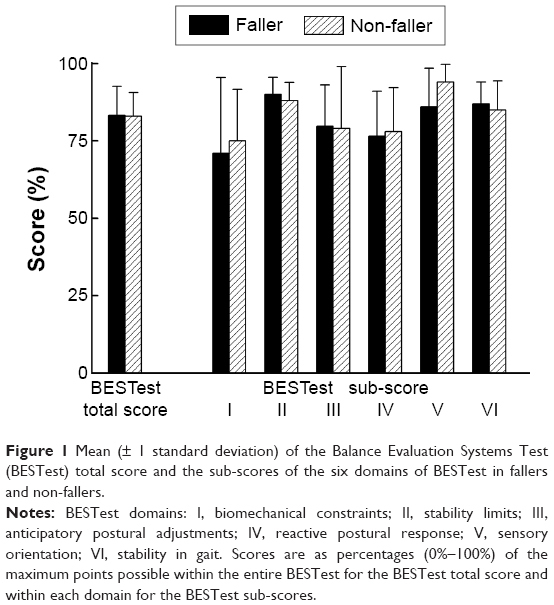 The Balance Evaluation Systems Test (BESTest) to differentiate balance deficits. Phys Ther. 2009;89(5):484–498. cancer.gov [homepage on the Internet]. NCI Dictionary of Cancer Terms. National Cancer Institute. Available from: http://www.cancer.gov/publications/dictionaries/cancer-terms?cdrid=450125. Accessed August 18, 2015. Groll DL, To T, Bombardier C, Wright JG. The development of a comorbidity index with physical function as the outcome. J Clin Epidemiol. 2005;58(6):595–602. Bakker K, Apelqvist J, Schaper NC; International Working Group on Diabetic Foot Editorial Board. Practical guidelines on the management and prevention of the diabetic foot 2011. Diabetes Metab Res Rev. 2012;28 Suppl 1:225–231. Peters DM, Fritz SL, Krotish DE. Assessing the Reliability and Validity of a Shorter Walk Test Compared With the 10-Meter Walk Test for Measurements of Gait Speed in Healthy, Older Adults. J Geriatr Phys Ther. 2013;36(1):24–30. Peretz C, Herman T, Hausdorff JM, Giladi N. Assessing fear of falling: Can a short version of the Activities-specific Balance Confidence scale be useful? Mov Disord. 2006;21(12):2101–2105. Bursac Z, Gauss CH, Williams DK, Hosmer DW. Purposeful selection of variables in logistic regression. Source Code Biol Med. 2008;3:17. Rubenstein LZ. Falls in older people: epidemiology, risk factors and strategies for prevention. Age Ageing. 2006;35 Suppl 2:ii37–ii41. Freiberger E, de Vreede P. Falls recall – limitations of the most used inclusion criteria. Eur Rev Aging Phys Act. 2011;8(2):105–108. Delbaere K, Close JC, Kochan NA, Sachdev PS, Lord SR. Good memory as a predictor of falls: fact or artefact. Age Ageing. 2012;41(3):404–408. Zecevic AA, Salmoni AW, Speechley M, Vandervoort AA. Defining a fall and reasons for falling: comparisons among the views of seniors, health care providers, and the research literature. Gerontologist. 2006;46(3):367–376. Panel on Prevention of Falls in Older Persons, American Geriatrics Society and British Geriatrics Society. Summary of the Updated American Geriatrics Society/British Geriatrics Society clinical practice guideline for prevention of falls in older persons. J Am Geriatr Soc. 2011;59(1):148–157. Wildes TM, Dua P, Fowler SA, et al. Systematic review of falls in older adults with cancer. J Geriatr Oncol. 2015;6(1):70–83. Friedman SM, Munoz B, West SK, Rubin GS, Fried LP. Falls and Fear of Falling: Which Comes First? A Longitudinal Prediction Model Suggests Strategies for Primary and Secondary Prevention. J Am Geriatr Soc. 2002;50(8):1329–1335. Niederer D, Schmidt K, Vogt L, et al. Functional capacity and fear of falling in cancer patients undergoing chemotherapy. Gait Posture. 2014;39(3):865–869. Fritz S, Lusardi M. White paper: “walking speed: the sixth vital sign”. J Geriatr Phys Ther. 2009;32(2):46–49. Studenski S, Perera S, Patel K, et al. Gait speed and survival in older adults. JAMA. 2011;305(1):50–58. Quach L, Galica AM, Jones RN, et al. The Nonlinear Relationship Between Gait Speed and Falls: The Maintenance of Balance, Independent Living, Intellect, and Zest in the Elderly of Boston Study. J Am Geriatr Soc. 2011;59(6):1069–1073. Duncan RP, Leddy AL, Cavanaugh JT, et al. Accuracy of fall prediction in Parkinson disease: six-month and 12-month prospective analyses. Parkinsons Dis. 2012;2012:237673. Wampler MA, Topp KS, Miaskowski C, Byl NN, Rugo HS, Hamel K. Quantitative and clinical description of postural instability in women with breast cancer treated with taxane chemotherapy. Arch Phys Med Rehabil. 2007;88(8):1002–1008.